John Carter had slept for a long time. When he woke he saw two of the tall bird warriors watching him though the bars of his cells. “Sasoomian, Do you know that you make strange noises when you sleep?” said one of the two Emerin guards. “We have food for you. It is just stewed Musk rat,” said the other guard. A human slave pushed a long brown pottery bowl though the bars. There was a brown thick stew with a wooden spoon. It surprisingly smelled rather tasty. The Warlord, picked it up and began to eat. The two Emerin let out strange calls, that reminded the earth man of crows. He took it to be their form of laughter. “No one who enters the arena ever comes out alive.” informed the tall feathered guard. John Carter saw behind the guards the slave who brought him food. He saw he was crying, tears streaked his dirty face. He saw the slave smile at the thought of a human victory in the arena. The Two Emerin just cawed with their unmusical laugh and walked away, while John Carter ate in silence. He looked up and saw the slave return, this time with a small loaf of bread. “They say you are the Kali-Maaka?” he said softly as he extended the bread between the bars. John Carter extended his hand through the bars. The slave gently touch him and smiled, his eyes closed, overcome with emotions. “When, Kali-Maaka? When?” he asked his eyes still closed. At that he left the jail leaving John Carter to his thoughts. The slaves needed to revolt against the flesh eaters, thought the Warlord. Maybe he would be their savior after all. The birdmen must be defeated. The time passed slowly in confinement. The food came, the guards watched, he was alone in his thoughts. At least Valla was safe in the caves of the Raksa with Turan. He must somehow escape Dhaimira and the inner world of Barsoom. “You are deep in thought,” came a voice with the accent of the Emerin. He looked up expecting to see a guard and saw the scientist Bulanta Kin looking at him. “I was thinking of how I could escape and kill as many of the Emerin as possible,” he said. “You shall see when I cut out your heart—if you have a heart.” added John Carter. The Warlord saw the beak of the birdman glow red—he was getting angry. 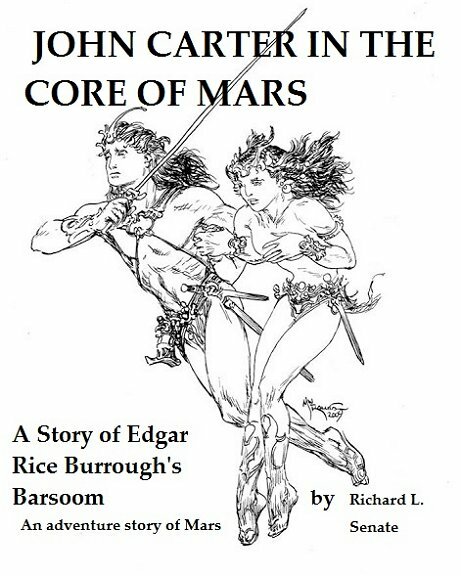 “I know your ray can kidnap people and animals from Barsoom and Sasoom but have you tried other worlds?” asked John Carter. “Yes, we have had success with other worlds, we have taken creatures from other worlds.” said the bird scientist. “I have see the remains of the city—it must have been beautiful,” added John Carter. The scientist just blinked at him for a long moment. “Do they have anything like our great ray?” The Emerin asked. “Couldn't you use the ray?” asked John Carter. “Kidnapped, you mean.” sneered John Carter. “I can escape, I can arm the Raska—we can march on this city and pull it down,” at that John Carter, lunged forward and tried to seize the creature by the neck. This caused the birdman to step back in surprise. The swiftness of the attack shocked the scientist. And he left without saying another word. The guards left him alone in his thoughts as the slaves brought him food and drink—it was rich food and delivered in silence as the guards watched, but the slaves were all smiles. John Carter slept several times as he thought of the best way to capture this walled city and bring it down. He was brought out of his sleep by the blast of a horn that echoed over the whole city. He saw through the long windows that a large red flag was flying over the city. He knew something was up and his time of reckoning was near. A slave ran into the prison with a bowl and goblet. John Carter took the bowl and ate the meat, and drank the sweet wine they offered him. “Be ready, when the sign comes to rise up and strike home!” the Warlord said as he ate. He didn't know when his next meal might be offered. “We will be ready Lord, Kali-Maaka,” he said with a low bow. As the slave left, a score of well armed Emerin marched in. A colorful officer had a scroll. He went to the cell as John Carter finished his wine. “By my count its thirty -two,” interrupted John Carter. “What am I to fight?” he asked. “Then, I am glad that it isn't up to you,” said the Warlord. “I promise you a day that will never be forgotten by the Emerin!” The birdman officer was silent—his beak red with hate. The cell door was unlocked and John Carter stepped out and towards the door, surrounded by the guards. Turan organized the army in the Zodangan fashion because that's where he had been trained long ago when Zor and Zodanga were allies. He made sure each of the warriors were given the new crossbows and knew how to use them. When the expedition to the wreck site returned he had the weapons recovered from the downed Heliumetic ship distributed to the Barsoomians who knew how to use them. They even found some pistols—one of them he gave to Valla. “Its the smallest of the ones we recovered and I thought of you, my love.” This caused Valla to smile. “For that you deserve a kiss.” she kissed him as the assembled warriors let out a cry and a hoot like fighting men do on Earth or Mars. The men just smiled and sighed, a few wandered off to find their own wives and sweethearts for a a farewell kiss. There was a tribal feast and the army was off to Emerini, they had one of the Radium cannons and four of the oversize crossbows with them. Some fired explosive charges from the ship. They hoped these arrows might breach the white walls of the city. “Death to the feather heads!” chanted the men as they started out to reduce the city of their enemies. As they marched they kept an eye out for the red flag that would herald the games in Emerini. Marching with them was Maas and Tar, with them the great ape. They knew the apes would follow and join them in the attack. “We shall free him, and he shall free us all from the beaked ones,” said Tar. “Look!” came a cry from the assembled army. All were pointing toward the city above them in the strange curved landscape of the Inner world of Barsoom. Turan saw a large red flag floating over the city—the games were on. “We must pick up the pace! We must reach Emerini in time!” ordered Turan. No one answered his words but a look of grim resolve filled the ranks. Even the Gorilla, Kunge, seemed to understand the significance of the red flag. He signed to Maas and she translated for Turan and the others. “Thank you,” replied Turan. “Issis be with you, friend Kunge!” As he spoke the gorilla quickly swung into the trees and vanished in the upper levels of the forest. The whole of the Raska Army was moving faster now heading for the white city. “I wonder if we will be in time?” mused Tar. John Carter was marched through the town, many seemed to cheer him, most of the Emerin shot back foul worlds and insults as he passed. The slaves were silent, some of the women were in tears. “We believe in you!” cried one slave, a birdman struck him in the face with a fist for his impudence. “Kali-Maara,” cried an old woman. “Lead us, we shall follow.” A birdman warrior drew his sword and killed her. “You will know the time,” shouted back John Carter. “Be silent, beast!” ordered a guard, his beak red with rage. “I still live!” answered the Warlord of Mars. “But not for long!” sneered another feathered warrior. They were heading towards the huge white arena where the huge scarlet pennant floated. It was a large structure, of white marble. Many of the Emerin were entering through six gates. From his vantage point John Carter could see the arena was nearly full. “Looks like everyone is here!” commented the Warlord. “We come to see justice done!” added the guard. “That you will, that you will.” the earth man answered him with a smile that seemed to confuse the creature. “You are unlike anyone I have even encountered,” added the guard. The beak on the creature turned red, but he was silent as they entered the arched portal Into the rooms where the animals were housed in cages. He saw leopards, panthers, and lions, as well as a Barsoomian Banth. “The Dator has selected the animal you are to fight.” the guard said coolly. “These do not see to frightening to me.” replied The Warlord. “It is not one of these, I am told, but something different.” The guard said. John Carter was placed in a cell, as a trumpet blasted out starting the games of death. He saw men, like himself, slaves, sent to the arena to battle lions and leopards, being given only spears and daggers. None of the humans returned alive to the dim pits before the arena. John Carter could hear the roar of the crowds with each death. An officer approached him with a peacock blue uniform, trimmed in scarlet. “Carter of Sasoom, what weapon would you like?” the officer asked with a sneer in his voice. John Carter didn't answer, deep within him he felt it was a trap. But he smiled—letting the birdman think he believed him. The guards lead him down a dim tunnel that ended in a portal of bars, He could see the Arena that reminded him of the old coliseums of ancient Rome. Many small flags were waved by the watching Emerin. There was even music, a strange warbling march of brass horns. John Carter saw the sword, sticking in the center of the arena. He decided that his best move was to jump in great leaps to the weapon and pull it from the sand. As soon as he entered the sand covered arena he looked about for whatever foe would be set against him. He saw none. He ran a few steps and leaped, in long jumps toward the sword. The high jumps were produced by his earthly muscles and caused a gasp to escape from the beaks of the watching birdmen. He got to the sword, a Barsoomian blade taken from the men when they were first captured. He seized the hilt and pulled with all of his might. The sword came up quickly. One look told him why—the gleaming blade was broken in half. He was left with half a sword—with no point! It was a cruel trick only the cunning mind of the Emerin could conceive. The animal turned to the watchers and roared, then it looked at John Carter, its ears went back. It snarled once and began to bound towards him with murder in its eyes. The crowd went mad with cheering! The powerful tiger rolled and tried to dislodge the man, but the Warlord wouldn't let go. Now he cut the things jaw and face with the broken sword, as it shook back and forth. The blood flowed and blinded the cat. How the thing had its tongue out and was snorting with rage. The paws came up to rake him but only a few superficial cuts were made as the two animals from Earth battled. A few of the bird creatures, seeing the broken weapon John Carter was given, started to root for him, yelling out “Sasoom! Sasoom!” Some of the slaves who watched added their voices, crying out “Kali-Maaka.” John Carter used every bit of his strength to hold on and not let go. If he should be dislodged, he would be killed almost instantly. He used the knife edge to try and cut the beasts throat, hacking at the animals Juggler vein. He used his Earthly power to try to kill the tiger, but it was strong and determined. They had starved the animal in hopes it would make him fierce and hungry, all it did was weaken the big cat. Still it was a formidable opponent and a lesser man would have slipped from his hold and been a victim of the animals fangs and claws. The battle seemed to last for hours but in fact it was only a few minutes before the knife found its mark and the Tiger fell dead. John Carter, stood up, then hacked off the tigers head and carried the trophy, still dripping with blood to the huge ornate golden chair where the Dator of the Emerin state, his face a mass of shock and disbelief. “Do you have other creatures for me to battle?” he cried out, then he seized the tigers head by the hair and threw it to the Dator. The leader jumped as the severed head hit the side of the chair and bounced into his lap—the blood staining the fancy uniform he wore. The Birdman's eyes grew large in hate and fear. “Send in the lions! Send them all in and end this!” ordered the Dator. The guards bowed low, and John Carter heard a squeak behind him and saw another barred door open as trainers with long spears prodded the lions into the arena. There were perhaps a dozen of the huge felines. “I still live!” commented the Warlord, more to himself than anyone else. Just then a sound came over the city—a sound John Carter knew well. It was the report of a radium cannon! It came from the left. He saw arches of flame cross the sky and hit building, bursting into balls of fire, some exploded upon contact. A gasp came from the assembled birdmen as a trumpet sounded an alarm. They were under attack. Seeing their panic caused John Carter to smile. The lions that were loosed to attack him were confused by the blast of horns and the arches of flame in the sky. For this, John Carter was glad. He ran towards them as they cowed together, confused. He leaped upon the tallest one of the lions and used it to jump up to the railing. Only his earthly strength could have accomplished such a move. The Emerin ran from him, with only one drawing a sword to face him. John Carter had his broken and bloody sword and used it to parry an attack, then seized the tall warrior's wrist and pulled him towards him—thrusting the broken sword into the thick feathered chest of the creature, driving it in to the hilt. As it died, he took from it its sword and dagger and ran up the stairs where his appearance caused more panic in the fleeing Emerin. Only one more of the birdmen let out a cry and drew his sword. The fight was fast and furious, the blades swirling and flashing in the noonday sun of the inner world. The man was a good fencer, but, John Carter broke his guard and in one swift motion pulled the weapon from his gasp. Their was a look of shock on the pigeon-like face of the warrior as the Warlord ran him through the neck. There was a loud explosion to the left, the Raska had breached the walls of the White City! The arena was empty, even the Dator had fled. The Warlord knew he must join the attackers and help them—they must seize the tower that housed the great ray and return to the surface! He wondered why the terrible weapon was not in used at the moment. He could only assume the Emerin had been taken by complete surprise. But, he knew it would soon be employed and against it nothing could stand. Now he could see fires were burning in the city, caused by the large arrows with burning brands. The Emerin were quite advanced but they seemed to have forgotten about firefighting. He didn't know that many of the slaves were in rebellion and setting more fires all over the metropolis—The time for freedom had come! Years of pent up hate for the many abuses inflicted upon them had overcome their fear of the birdmen. Their rage had boiled to the surface. Believing in their savior, they set aside their apprehension and struck back. Never had the Emerin faced such an uprising. Coming at the same time as an attack on the city, it caused panic. Now the Bird creatures felt the fear they had instilled in others. John Carter saw small flyers rise from the city and the Dator's palace. Two were shot down by a radium cannon. He could tell the Raksa and Barsoomians were perhaps a mile away, he jumped down the now deserted exit to the arena. He heard roaring from the barred door that blocked the lower level of the building. He saw the lions inside looking at him. He ran to the door and, working the latch, opened it and released the big cats, who took off, perhaps looking for food! He knew that this might spread further discord among the feathered ones. He now started to run to the sounds of fighting. He hadn't gone far when he encountered a group of slaves lead by Sha, the slave he had met in the prison. He was armed with a bloody saber, taken from a dead Emerin. “Kali-Maaka! We serve you!” he shouted to John Carter. “Then follow me, Follow me to freedom,” cried the Warlord. He ran toward the sound of battle. Just then, from the tallest white tower a brilliant white beam flashed out. It was aimed at the attacking army. “We have to shut down that weapon!” John Carter said. He changed coarse and ran toward the tall structure. “Just follow me,” added the Earth man. They obeyed without hesitation. Leading the small group of ex-slaves felt good to John Carter. He for a moment felt like he did at Valley Dor or Chancellorsville when he was leading troops into battle. He only wished he had Green Tharks or the Stonewall Brigade with him as they approached the tower. The ray flashed out two more times, John Carter could only imagine the destruction caused by the thing. Still the flaming shafts kept arching though the sky and causing fires. Some even set off explosions. The Radium cannon was silent now, a victim of the terrible white ray. The Rakas lead him down a deserted street, turned a corner and before them loomed the tall structure. As soon as they were visible the Emerin shot exploding spears at them, forcing the Warlord to retreat into an alleyway. “Impossible is a word found only in the dictionaries of fools,” commented John Carter. “How can we get passed the guards?” asked one of the slaves. “Is their another entrance we can try?” he asked. “Just lead us to the second door,” ordered John Carter. The former slave just nodded his head and ran around the structure and through a maze of alleys and corridors. The Warlord was glad he had such a guide. They rounded a corner, and across the short plaza was a small wooden door. No guards were present. “You are Kali-Maaka,” Sha said, “I will go.” At that he turned and ran up the narrow plaza coming to the door and pulled upon the wooden handle. It opened! Beyond it was just an empty hallway. Sha seemed as surprised as anyone. John Carter lead the others to the door. “I will never doubt you again, Kali-Maaka.” he said as the whole group went into the science building. John Carter just smiled, “Good, I feel like a fight!” The other ex-slaves also smiled, years of hate fueled a desire for revenge. The slaves nodded in agreement. At the end of the hall was a window, and from it came the bright flash of the weapon. The whole building trembled when the thing was used. “Lead us Sha--” ordered the Warlord. He pointed down a deserted hall that lead to stairs that went up. This was the first time John Carter had encountered stairs on Barsoom. Mostly ramps were used. They quickly went up, the stair way was deserted—The whole building seemed almost abandoned. As they went up, the building trembled again. They climbed six floors up without opposition. The stairs ended in a doorway. John Carter slowly approached the door, ready for anything. He slowly opened the door and when it was open a crack, he peered in. He saw Emerin, a dozen or more, working at machines. All had their backs to him. He could tell by the feathers that they were both male and female. He saw no warriors in the room, but he could bet that some were there. “Be ready to fire!” ordered one. John Carter opened the door slightly and saw it was the scientist Bulanta Kin. This caused the Warlord to smile. He closed the door and turned to his men. “The ray weapon is being controlled from this chamber,” he whispered. “Maybe a dozen, mostly scientists—few guards.” As he spoke the building trembled again. They had fired the ray. “I rather die fighting than continue to serve these monsters,” commented Sha. “Let us attack now—before they can fire the ray again!” said the Warlord. “Now!” cried John Carter as he burst through the door. As expected, there was a guard not far from the door. He was the fattest Emerin John Carter had encountered. As he saw them enter, the birdman drew his sword. But John Carter leaped with his sword extended and ran him through with one thrust. The man looked at him, blinked his eyes and died. The other Emerin were caught by surprise by the war now in the very chamber. Some ran, other drew weapons and tried to defend themselves. John Carter looked for the scientist in charge of the unit. He leaped towards him. The birdman ran away towards a large panel of switches. “You shall not get the ray, Sasoomian Carter.” the tall feathered scientist said as he pulled a lever. The bird creature croaked out what was a laugh. There was a loud explosion, the equipment, just blew up, throwing many to the floor. “Never!” At that the earth man tried to grab him, but the scientist drew a dagger. For a moment John Carter thought he would fight him with the smaller blade, but, in one swift stroke the feathered creature stabbed himself! As blood flowed down his chest the scientist smiled. “Is there another ray?” asked John Carter as he threatened the dying scientist with his sword. “No...no.. other.” said the birdman as it fell to the floor, dead. John Carter was looking over what was left of the laboratory. He didn't understand all of the wires and relays. Then, in a corner he saw a piece of equipment he did recognized. It was something originally from the Barsoomian surface. A wireless unit. He ran to it. “Perhaps better!” he said as he switched on the unit. Would it work? Could it reach the surface? He could see it was Zoldangan in make but very much like the units used by Helium. He turned it on and sat down in front of it. He tried the dials and set it for the frequency of Helium. Could the unit reach the outer world? Could he make contact?